Set the percentage of profit from the transaction. Set the expiration time in seconds. Make several deals in a row. Keep track of the time before expiration. 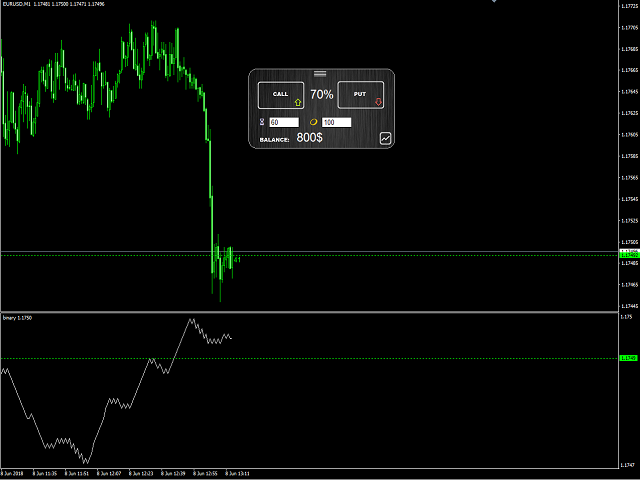 The tick chart with trade levels is duplicated to an additional window for accuracy. It allows you to work both in the testing mode and in the real quotes mode. The program gives an idea of binary options trading. Allows you to test and develop your systems and test them on history. With this product you will know for sure whether you are ready for real trading conditions on binary options. Note: working in the test mode does not guarantee the accuracy of closing positions at the price, as in the test mode, ticks are generated by the terminal and are not a copy of historical data. I recommend to test yourself on real quotes and real time.